Typhoon Soulik crashed into South Korea's southernmost island, Jeju, on Thursday and is forecast to affect the capital city the following morning on its way north, weather authorities said. The powerful tropical storm was heading north at a speed of 23 km per hour through seas about 90 km off the southwestern port city of Mokpo as of 6 p.m. according to the Korea Meteorological Administration (KMA). It was moving at a speed of 4-8 km per hour earlier in the day. 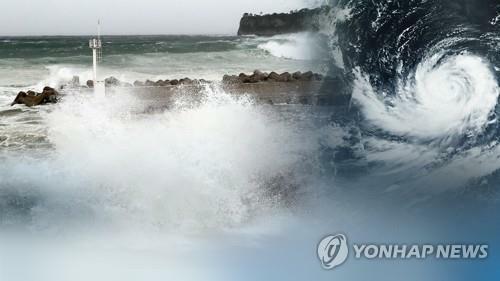 The KMA said that the typhoon is expected to land on Byeonsan Peninsula on the west coast at around 2 a.m. Friday. Soulik was initially forecast to hit Seoul at 4 a.m., but as it is expected to change course toward the country's central area, the capital is not likely to be directly hit. The typhoon will probably come closest to Seoul at around 9 a.m. Friday. Soulik has a wind radius of 300 km with a central pressure of 970 hPa. Within the radius, its maximum wind speed could reach 35 meters per second (m/s), or 126 kph. The KMA said a maximum wind speed of 35 m/s is strong enough to overturn a running truck. Visibility is reduced to almost zero for people at sea, it said. Typhoon rains totaling 971 mm pounded part of Mt. Halla, the largest mountain on Jeju, with 125.4 mm of rain falling in the island's southern city and 282.1 mm in the north overnight and up till 1 p.m.
One woman in her 20s went missing and another man was injured, and the storm had caused blackouts in 6,517 households as of 11:00 a.m. Most provinces have issued typhoon warnings and taken precautionary measures to minimize possible damage. Major ports across the nation have closed temporarily and 650 flights at Jeju airport have been canceled. Over 300 flights at Incheon and Gimpo airports were also called off. Over 7,800 schools in the country have closed because of the typhoon.